On May 26, join us from 3-6 pm at The Bridge restaurant, just steps from our outdoor stage, for a sunny celebration of spring and the launch of our 34th season of Theatre Under the Stars. We have an exciting upcoming summer in Strathcona Park – from July 25 to August 25, Odyssey is delighted to present the Canadian premiere of The Bonds of Interest by Spanish playwright and Nobel-Prize winner Jacinto Benavente. A masterpiece of comedy and satire, the play follows two penniless con artists concocting a devious scheme to get rich. In vibrant new translation and adaptation with Out of the Wings organization in the UK, Odyssey will weave its signature masks, original music and choreography with the play’s delightful wit to produce a stunning summer production. Inspired by the Spanish origins of our season, we look forward to sharing with you a taste of Spanish cuisine and culture. Newly renovated, The Bridge restaurant along the banks of the Rideau River offers an idyllic view from its bright interior and outdoor rooftop terrace. A chance to bid on exciting prizes and summer experiences and participate in Odyssey’s 2019 Wine Raffle (instructions below). Tickets only $10.00 for children 12 and under! Tickets available by phone at 613-232-8407 or by clicking this link. 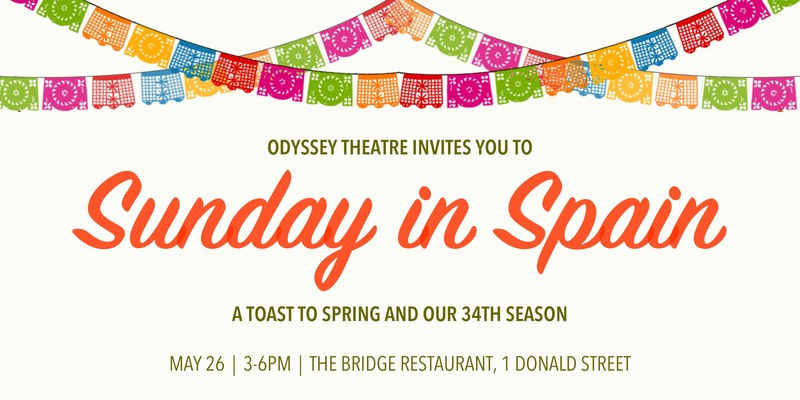 All proceeds from the Sunday in Spain fundraiser will go towards Odyssey’s 34th Season. Buy your tickets before May 1 and enter a draw for the chance to win 2 tickets to our 2019 Theatre Under the Stars production! Odyssey Theatre is renowned for signature masked performances that draw inspiration from Italian Commedia Dell’Arte and a range of fairground theatrical arts. This approach lets us conjure imaginative worlds and tell powerful stories that engage wide audiences in a celebration of the human spirit. We create original work and bold adaptations of classics from the international repertoire that revel in social satire and journey into the world of myth and folklore. Through collaboration with artists from diverse theatrical cultures and traditions, we forge new directions in our creative work. The theatre is committed to supporting artists in our field and is passionate about nurturing young artists. Ottawa’s premier professional summer theatre is returning to beautiful Strathcona Park along the banks of the Rideau River for our 34th season of Theatre Under the Stars. In addition to producing the world premiere of an exciting new translation, we are gearing up for 2 New Play Creation workshops with international artists, our renowned Youth Apprenticeship Program and expanding our Community Neighbours Program, to give deserving members of our community the chance to experience the magic of live theatre. We have many more special programs and projects in the works for this season – subscribe to our mailing list to stay up to date on Odyssey news! We are thrilled to welcome Madeleine Hall as our new Artistic Directing Intern for Odyssey’s 34th season! Madeleine Hall is an Ottawa-based theatre creator, writer, performer, and co-Artistic Director of the award-winning physical theatre collective Aplombusrhombus. Her full-length solo project Ethel premiered at the 2017 Ottawa Fringe, where it received festival awards for Outstanding New Work and Outstanding Overall Production, as well as Prix Rideau Award nominations for Outstanding New Creation and Outstanding Emerging Artist. Madeleine has led the development of numerous original creations, incorporating both physical and text vocabularies, which have been mounted at festivals across Canada, including national Fringe festivals and Ottawa’s undercurrents and Fresh Meat. Her teaching experience includes facilitating workshops and courses in theatre creation and performance at the University of Ottawa, The Ottawa School of Theatre, Canterbury High School, and The Ottawa School of Speech & Drama. She holds a BA from McGill University, and furthered her training at The Ottawa Theatre School and L’École Philippe Gaulier. This Artistic Directing Internship is made possible thanks to the support of the Metcalf Foundation Performing Arts Internships. When in Ottawa, stay at the Official Hotel of Odyssey Theatre, Cartier Place!